Thysanoteuthis contains a single species. 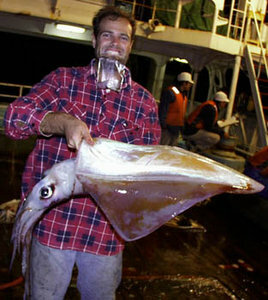 T. rhombus is a large, muscular squid (ca. 100 cm ML max.) 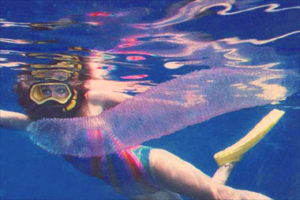 found throughout tropical and subtropical regions of the world's oceans. It occupies near-surface waters during the night and midwaters during the day. It has rather short arms and large triangular fins that extend the full length of the mantle. 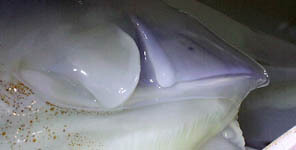 It is fished commercially in the Sea of Japan and off Okinawa. with "lazy T"-shaped groove of funnel locking-apparatus. Buccal crown connectives attach to ventral margins of arms IV. and opposing nuchal knobs and pits. Figure. Anterior view of the nuchal locking-apparatus (white knobs in the center of the photograph) of T. rhombus, central North Pacific. Photograph by R. E. Young. Figure. 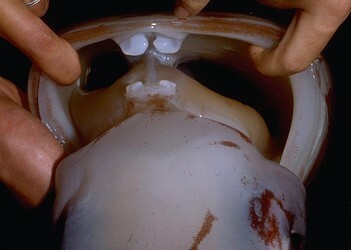 Ventral view of funnel locking-apparatus of T. rhombus; anterior is to the left. Photograph, central North Pacific, by R. E. Young. Fin length equals mantle length. Fins insert on sides of mantle rather than gladius. Vanes of gladius project anteriorly. Figure. Ventral view of the T. rhombus gladius, 188 mm GL. In addition to the anteriorly projecting vanes, note the conus field but the absence of a conus. Drawing from Toll (1998). A list of all nominal genera and species in the Thysanoteuthidae can be found here. The list includes the current status and type species of all genera, and the current status, type repository and type locality of all species and all pertinent references. 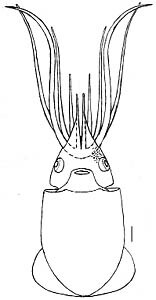 T. rhombus lays sausage-shaped egg masses that float just beneath the surface of the ocean (Suzuki, et al., 1979). Eggs lie in a double strand that winds helically around a large gelatinous core. Embryos near to hatching bear large numbers of chromatophores. 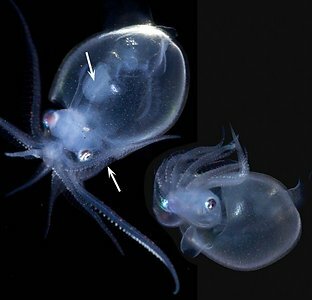 This is the most commonly observed egg mass of any oceanic squid. Figure. Left - T. rhombus egg mass with pink egg strands visible around the periphery of the egg mass. Photograph by Alberto Romeo with his wife, Lucia, in the background. Photograph was taken in the south Tirreno Sea within the Mediterranean Sea. Right - Advanced embryos from a T. rhombus egg mass, off Florida. Photograph by T. LaRoe. The dense arrangement of chromatophores on the mantle of the embryos provide the pink color of the left photograph. The paralarvae of T. rhombus are distinctive. The small eyes and the numerous chromatophores (incompletely shown in the drawings below) are characteristic as are the attenuate arm tips in the larger paralarvae. In large paralarvae, the second and third arms also have long slender trabeculae which are not shown in the drawing but are apparent in the photographs below. The growth from hatchling to 15 mm ML is illustrated and discussed in detail in Wakabayashi et al. (2015). Suzuki, S., H. Misaki and T. Okutani. 1979. Studies on early life history of decapodan Mollusca. VIII. A supplementary note on floating egg mass of Thysanoteuthis rhombus Troschel in Japan - The first underwater photography. Venus 38: 153-155. Naef, A. 1921-23. Cephalopoda. Fauna e Flora de Golfo di Napoli. Monograph, no. 35, 863 pp. Nigmatullin, C. M. and A. I. Arkhipkin. 1998. 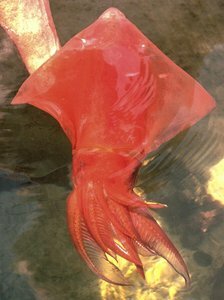 A review of the biology of the diamond back squid, Thysanoteuthis rhombus (Oegopsida: Thysanoteuthidae).p. 155-181. In: (T. Okutani, Ed.) Contributed Papers to International Symposium on Large Pelagic Squids. Japan Marine Fishery Resources Research Center, Tokyo. Wakabayashi, T., Tsuchiya, K., & Segawa, S. (2005). Morphological changes with growth in the paralarvae of the diamondback squid Thysanoteuthis rhombus Troschel, 1857. Phuket Marine Biological Center Research Bulletin, 66, 167–174. from Naef, A. 1921-23. Cephalopoda. Fauna e Flora de Golfo di Napoli. Monograph, no. 35, 863 pp. Page: Tree of Life Thysanoteuthidae Keferstein, 1866. Thysanoteuthis rhombus Troschel, 1857. 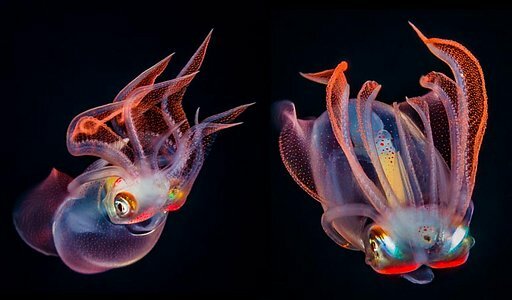 The diamondback squid. Authored by Richard E. Young and Michael Vecchione. The TEXT of this page is licensed under the Creative Commons Attribution-NonCommercial License - Version 3.0. Note that images and other media featured on this page are each governed by their own license, and they may or may not be available for reuse. Click on an image or a media link to access the media data window, which provides the relevant licensing information. For the general terms and conditions of ToL material reuse and redistribution, please see the Tree of Life Copyright Policies.